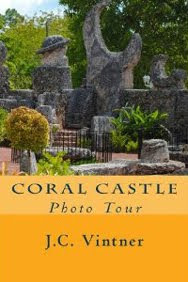 Journey through a 59 page full color photo tour of Ed Leedskalnin's Coral Castle. From the recent road trip to visit this magnificent garden, a wonderful photo tour experience through the megalithic stone creations of Ed Leedskalnin. How did a five foot tall 100 lb. man could move rocks weighing tons so easily and with such precision? Learn more about this monumental construction with J.C. Vintner's photo tour book, or view some of the Coral Castle photos, and even take a guided video tour through the rock garden. Pursuing the truth about mankind's ancient mysteries, unexplained phenomena, and philosophies changing the world today. © Ancient Mysteries Blog. Powered by Blogger.